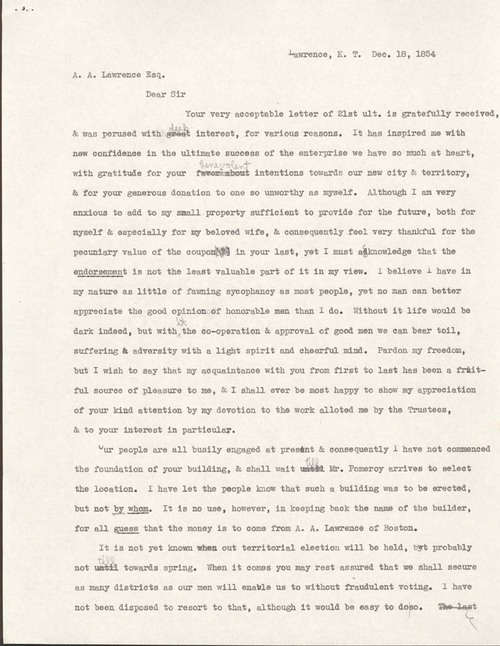 Transcription of a letter from the Amos Adams Lawrence Collection, Massachusetts Historical Society. Charles Robinson wrote from Lawrence, Kansas Territory to Amos A. Lawrence in Massachusetts. Robinson thanked Lawrence for his unfailing support of the enterprise of the Territory and claimed his devotion to work done in his interest. He discussed Lawrence's development, having secured the offices of three free state newspapers, but expressed anxiety about the upcoming territorial election. However, Robinson vowed that his men would not resort to fraudulent voting to win the majority over proslavery supporters.